Shiga Prefecture, located in the Kansai Region of Central Japan near Kyoto and Nara is an area rich in natural beauty and historical attractions. It is home to more temples and shrines than Kyoto, making it a must see destination for any fans of Japanese history and culture. Shiga also has the largest lake in Japan and is enclosed by mountain ranges, which means you can easily enjoy the fun outdoors with swimming beaches, hiking trails, camping, lake cruises and high-class skiing in winter. In the third instalment of my “Fun Things to do” series, I will highlight some of the fun places to visit in this amazing prefecture. I hope you can add them to your list the next time you are in the Kansai Region of Japan. Hikone Castle is one of the few original castles left remaining in Japan and is an excellent example of Japanese castle architecture. 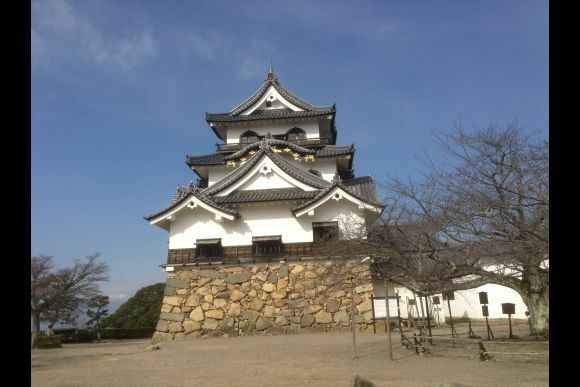 The main castle tower is an official national treasure and the castle itself is regarded as one of the finest in Japan. The upper stories of the main tower offer fantastic views of Lake Biwa and the surrounding area. After visiting the castle make sure you also check out the garden at the foot of the castle called Genkyu-en Garden. It’s a classic garden with Chinese influences. The garden contains a sprawling villa built in the Chinese Tang Dynasty style for the fourth lord of Hikone. The teahouse is the perfect place for some quiet Zen contemplation with a cup of matcha (green tea) and Japanese wagashi sweet. Koka is famous for its ninja history and the Koka ninja clan, rivals to the Iga ninja clan in nearby Iga Ueno in Mie Prefecture. The Koka ninja clan were less well-known than their rivals and were said to have used stealth and deception to mask their size and power. Koka was situated on the ancient Tokaido Road which was the main route from Kyoto to Edo (modern day Tokyo) and strategically important. Today, the ninja are even harder to find, but you can discover their secrets at the Koka Ninja Mansion. Here you will find a 300 year old ninja estate that actually belonged to a famous ninja leader. The ninja house contains trap doors, false walls and hidden rooms that were designed to protect the home from potential intruders. You can also see a display of ninja weaponry and historical artefacts. If that’s not enough, you can even try your hand at some ninja throwing stars called shuriken in Japanese. Omihachiman is an Edo period castle town close to Lake Biwa that was home to the famous Omi Merchants. One of the must see attractions of this historic town is the Hachiman Bori Canal which was once transport central for the area and merchants. The canal which is connected to Lake Biwa allowed the merchants to transport their precious cargo to towns around the area. Today you can admire the beautiful scenery with white walled storehouses and old merchant houses along the canal. Enjoy a boat tour on the canal to soak up the historic atmosphere of a bygone period of Japanese history. Okishima Island is a fishing island that is the only inhabited lake island in Japan. This unique place has a long history with the majority of inhabitants of the island descended from a group of seven samurai who lost an ancient battle. During the mid-12th century a civil war was fought over the Japanese Imperial succession, which lead to Japan’s first shogunate government. The seven samurai mentioned above were defeated in a battle near Kyoto and escaped with their families to the small island to hide in self-imposed exile. You can take a small ferry to the island from Horikiri New Port in Miyagahama, Omihachiman for 500 yen. The best way to explore the island is on foot with the local residents enjoying an old style way of life that is becoming rarer to find in modern day Japan. The top of the island offers amazing views of Lake Biwa and you can experience virgin forests and pristine nature on the island that make it a truly unique experience. Lake Biwa, known as Biwa-ko in Japanese is the largest freshwater lake in Japan and is a popular tourist attraction in Shiga Prefecture. There are many water sport clubs situated around the lake, but one of the easiest and most fun things to do is take a cruise on its beautiful waters. From Otsu Port near Kyoto, you can board the “Michigan” paddle steamer an American style riverboat and enjoy spectacular 360 panoramic views of Lake Biwa and the surrounding mountains. On-board the paddle steamer you can enjoy a buffet style lunch while enjoying the scenic views. Shiga Prefecture is one of the most fun places to visit in Japan with everything from historic castles, temples and shrines to outdoor activities such as hiking, camping, swimming and skiing. I hope you will visit this amazing place on your next trip. Shiga Prefecture is easily accessible from anywhere in Central Japan. From Tokyo you can catch the Tokaido Shinkansen to Maibara and from Kyoto local trains make the Lake Biwa area easily accessible.